The first book-length study of women’s involvement in the Chicano Movement of the late 1960s and 1970s, ¡Chicana Power! tells the powerful story of the emergence of Chicana feminism within student and community-based organizations throughout southern California and the Southwest. As Chicanos engaged in widespread protest in their struggle for social justice, civil rights, and self-determination, women in el movimiento became increasingly militant about the gap between the rhetoric of equality and the organizational culture that suppressed women’s leadership and subjected women to chauvinism, discrimination, and sexual harassment. Based on rich oral histories and extensive archival research, Maylei Blackwell analyzes the struggles over gender and sexuality within the Chicano Movement and illustrates how those struggles produced new forms of racial consciousness, gender awareness, and political identities. ¡Chicana Power! 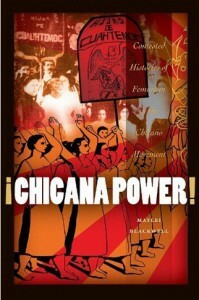 provides a critical genealogy of pioneering Chicana activist and theorist Anna NietoGomez and the Hijas de Cuauhtémoc, one of the first Latina feminist organizations, who together with other Chicana activists forged an autonomous space for women’s political participation and challenged the gendered confines of Chicano nationalism in the movement and in the formation of the field of Chicana studies. She uncovers the multifaceted vision of liberation that continues to reverberate today as contemporary activists, artists, and intellectuals, both grassroots and academic, struggle for, revise, and rework the political legacy of Chicana feminism.